Was totally fed up when I found out I had a cataract in my right eye and even more fed up when they said I had one growing in my left eye too! What luck. It was totally unexpected, the Doctors was my first port of call I thought it was just visual disturbances from a migraine. It was driving me crazy it was like black lace darting in front of my vision at times (its called a retinal migraine). Looking out of my right eye was like looking through the bottom of a glass. Apparently you can get cataracts from being on steroids a lot, I never realised this, another reason to monitor how many steroids I take. I shall be devoting a good part of this blog to medication we take for COPD at some point. I arrived at the hospital in good time for my appointment and was totally out of breath as usual, someone asked me if I would like a drink of water I always feel so embarrassed when I am out of breath because it draws attention to you and I just cant wait to get a bit fitter than this. The weight is still coming off so thats good. My appointment was running almost an hour late and I had to have some horrible drops put in my eye to help the optician see the cataract, they stung quite a bit. I then had to wait for a while in the waiting room to see the optician who’s office would be right at the end of the corridor. When I went in I was a bit out of breath but not as much as I had been and she looked straight at me and said are you a smoker! I said no I am not, my daughter was more cross than me. She said to me afterwards, is that the first thing that comes into peoples minds when they see someone who is out of breath? She got on my nerves a little because she kept asking me if I had diabetes which I don’t but now I think perhaps I should get it checked. She was very nice really, but her English was quite bad for someone who has to deal with the general public so much. Many cataracts take years to develop to the point where vision is seriously affected. Most occur as a result of the normal aging process. The types of age-related cataracts are usually described by their location in the lens. They are: nuclear cataracts, cortical cataracts and subcapsular cataracts. Mine is the later a subcapsular cataract and its very thick I am almost blind in my right eye. What was it caused by? Subcapsular cataracts affect the back of your lens and usually progress more quickly than other types. Subcapsular cataracts cause blurriness and glare, and are more likely to strike those with diabetes, extreme near sightedness, retinitis pigmentosa or people who take steroid medications. 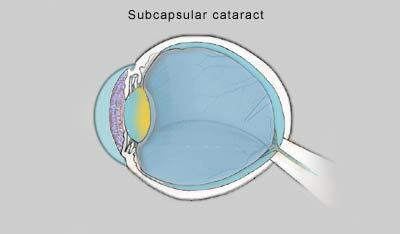 A subcapsular cataract builds up on the back of the lens. As an ophthalmologist for more than 25 years, I performed cataract surgery for well over half of those years. I counseled thousands of patients during that time on the benefits and risks of the procedure. But when I was diagnosed with “early” cataracts at 55 years young, I found that my most difficult counseling challenge was myself. For one thing, I was now considering going against the very advice I usually gave my own patients. I always was a very conservative cataract surgeon. This meant waiting until a patient’s visual acuity was at least 20/50 or worse before I had the serious discussion with them regarding possibilities of cataract surgery. During these consultations, many people with cataracts were dismayed to learn that surgery is their only option for restoring sight. The eye’s cloudy natural lens must be removed and replaced with an artificial one, known as an intraocular lens or IOL. Even when I stopped doing cataract surgery and after more modern and safer procedures were adopted, I would rarely — if ever — seriously discuss cataract surgery with someone whose visual acuity was 20/20 to 20/25 as measured on an eye chart. At first, I began noticing halos around street lights at night and glare from bright lights during the day. Before, I always had 20/20+ visual acuity without glasses. But cataracts were developing in both of my eyes, with my right eye much worse than my left. In my exam chair, I still could see the 20/20 to 20/25 line on the eye chart without much problem. In other words — and as I would always tell my patients in the past — I supposedly could see “just fine.” But about a year before deciding to have cataract surgery, I performed very poorly on a contrast sensitivity test when a glare source (bright light) was directed toward my eyes during the test. This means that scattered light and other interference from cataracts clouding my eye’s lens were making it much harder for me to distinguish objects from their background when the contrast between the two wasn’t starkly black and white (like letters on a standard eye chart). And closing my left eye made me feel as if I had a piece of wax paper in front of everything I saw. This view became even more opaque as time went by. The central blurriness and haziness in my right eye had rendered me almost monocular or “one-eyed.” I became left-eye dominant, because I still could see through this eye, where the cataract was not nearly as bad. My altered vision did not hinder normal daily activities. But when I performed surgical procedures, I noticed that I definitely was slowing down due to loss of contrast sensitivity. Because I no longer could see well with both eyes, I also experienced decreased depth perception. Even overhead lights failed to illuminate the surgical site as well as they once did. My portable surgical headlight also seemed to have lost some of its luminance. These complaints I voiced in the operating room were similar to those I had once heard from patients with “early” cataracts who protested that they required a lot more light to read comfortably. Outside the operating room, I found myself reaching for an old magnifying glass at my desk when looking at black print on a colored-background paper. So I hesitated, and followed the advice I almost always gave my cataract patients. Like any other ophthalmologic professional, I knew too much about cataract surgery, especially those “few and far between” complications. Why take any kind of risk unless I absolutely had to? And besides, I could see “just fine” — with occasional visual frustrations. I was headed west into a typical Florida sunset. Somehow, while I was switching lanes, the sun peeked between the edge of my sun visor and my rearview mirror just inside the frame of my windshield, creating a severe glare that momentarily blurred out my view of the road in front of me. Luckily, no cars were nearby, and the incident did not affect my driving. But that was the final straw. Next time, I realized, I might not be so lucky. And the risk of a driving accident of this sort far outweighed the now much slighter risk of undergoing cataract surgery. I am surrounded by excellent cataract surgeons, so selecting someone for my own procedure was not at all difficult. I chose Steve Updegraff, MD, who I had seen perform many cataract surgeries. But forcing myself to schedule the surgery was almost as difficult as making the decision to have the procedure in the first place. It’s well known that doctors make awful patients. For one thing, I knew far too much about the delicate body part upon which I was about to have surgery. I also had seen too many videos at conferences that illustrated “things gone wrong” during surgeries. Forcing myself to have the surgery was almost as difficult as the decision to do it in the first place.No question about it. I was very nervous, even though I had total faith in my surgeon. I lectured myself about the importance of being a “good” patient, and not one of those dreaded “doctor” patients. I told myself that I would leave the choice of techniques strictly up to Steve. Even though I was full of brilliant ideas about variations in techniques that might help my surgeon achieve the very best results, I decided to resist the temptation to offer him any of my many valuable insights. In preparing for my surgery, I had my first complete eye exam. Like most emmetropes, I had never needed glasses for my distance viewing; I needed only a pair of over-the-counter reading glasses, which I continue to wear. My choice of a monofocal intraocular lens (IOL) vs. a “premium” multifocal IOL was simple. My biggest complaints with the cataract were glare and halos. Because most of the visual complaints of patients who have premium IOLs result from the optics, I didn’t want to take the chance of continuing to have glare and halos with a multifocal lens. I actually became somewhat excited about the idea of exchanging my cataractous lens for an aspheric IOL. I had been intrigued to read that the optics of aspheric lenses may be superior even to those of the eye’s natural crystalline lens. Although Mother Nature had done a wonderful job producing a natural lens that had given me a half century of excellent vision, modern science has produced IOLs with superb optics ideal for focusing light rays. I received my preoperative eye drops, antibiotics to prevent possible eye infection and a nonsteroidal anti-inflammatory drug (NSAID) to control inflammation and swelling. On the day of surgery, while in the holding area, I asked for medication to calm my anxiety. However, I didn’t want too much, because I wanted to remember the surgery and recall as many details as possible. I remember the trip into the operating room and my surgeon saying “hello” to me. I received topical anesthetic drops, and then I was prepped and draped. Someone asked me to look straight up at the light, where I saw two thick, gray three-dimensional half circles slightly offset and separated by a space. During the procedure, my entire view was a light-colored gray, as if I were underwater looking through the water. This view never changed. I listened to the sounds of the phacoemulsification machine and tried to see the changes in my vision as my lens was broken up (emulsified) and then suctioned out (aspirated). Because of the brightness of the operating microscope light, my view remained virtually unchanged. My surgeon commented that my cortex (the soft, peripheral part of my cataract) was a little more tenacious than he had expected from what he saw on the microscopic (slit lamp) eye exam. But everything was going fine. My surgeon then announced that my cataract was removed. I looked up at that moment, and tried to see what vision was like without a lens (aphakic). But I still couldn’t make out any details. Everything looked the same. When my surgeon announced that the aspheric IOL was inserted into place, my view still was not much better. This was definitely disappointing, considering my anticipation. Instead, the three-dimensional gray half-circles remained exactly as I had seen them throughout the entire procedure.Then the drapes covering my face were removed. When my surgeon said everything had gone perfectly, I was totally relieved. I looked around the room and noticed that my photoreceptors (light-sensitive cells in the retina) were still bleached out. This condition results when a constant light aimed into the eye causes the photoreceptors to work overtime, without a chance to recover and replenish light-sensitive photopigments (chromophores). This creates a temporary situation where the photoreceptors are “bleached” or left without pigment needed for good vision. At least, I could see images and shadows in the room. That was definitely satisfying. I was agitated. I did not want to be myopic after cataract surgery. I had been emmetropic (good vision without correction) my entire life. I wondered whether I should say something now, or just wait. I was a doctor myself, after all, and I had to get this straightened out. Would I need another procedure? I hoped not. I tried to recall everything I could about clear corneal cataract surgery, the type of procedure I had undergone. I reminded myself that corneal edema or swelling typically induces a myopic shift until it resolves. I decided I would wait to say anything, although on the way home I continued to fret about the possibility of a less than optimum visual outcome. But on the positive side, and while I was busy second-guessing my surgeon, I did notice the color contrasts in the distance were amazing. By mid-afternoon, my vision quality had improved dramatically. But my visual acuity still was less than expected. I wanted what the television and radio ads promised: “off-the-table 20/20!” I was still more myopic than emmetropic, and I was unhappy about that. But, all in all, my day of surgery was totally uneventful. I took my prescribed eye drops to prevent infection and reduce swelling, and hoped for the best. I woke up on the first day after surgery and could not wait to remove my eye shield. My vision was a little more blurry than the day before, and I tried to explain this as overnight corneal swelling resulting from hypoxia (low oxygen) to the eye. Different factors can cause this, including stagnant tears that aren’t blinked away during the night. Regardless of the cause, this kind of swelling can cause a greater myopic shift. My near vision was still pretty good. I kept taking my eye drops. And by afternoon on the first postoperative day, the view through my right eye was like nothing I had ever recalled seeing before: clear and colorful in ways that even my best eyesight in younger years could not duplicate. One week after surgery I was seeing 20/15, a very good result. My vision was at least 20/25 before I had undergone cataract surgery. But this new 20/25 vision was not only different, but amazing. I equated my new vision to the day I had purchased my first high-definition television (HDTV). It was like looking at the world on an HDTV with my right eye and an old analog (cathode ray tube) television with my left eye. At this point, the “wax paper” sensation appeared to be in front of my left eye, which I had never noticed before the surgery on my right eye. And the left eye supposedly had been my good eye. Clearly, I was no longer myopic. The sharp contrast between any two objects of different colors was absolutely outstanding. On my first and second days after surgery, it seemed that every hour was better than the previous hour. Driving at night was visually amazing, too. My right eye could delineate sharp outlines of a dark car on a dark background. I saw no halos around lights. Images on the sidewalks and even inside cars were crystal clear. One of the most dramatic images that I saw initially was a Murano glass set that we have in our home. The glass is cobalt blue with 24-karat gold leaf designs and accents. This set is against a white wall. When I examined this glassware with my right eye only, it appeared almost three-dimensional because of the almost unbelievable contrast between colors. And, to this day, my “monocular 3-D” vision has continued. I had scheduled a full day of surgery on my second postoperative day. It was such a pleasure to be back in the operating room and, this time, on the other side of the operating table. The overhead lights were so bright that I had them turned down two levels. This was not because of light sensitivity, but because I could see everything so much better that I did not need the extra wattage. And when I needed to use my headlight for one case, the halogen beam had returned to a bright, white light that I didn’t recall noticing before. I even finished the day earlier than scheduled. My first “visual complication” occurred on the fourth and fifth postoperative days. On the fourth postoperative night, every point source of light (such as street lights, red tail lights, oncoming white headlights) had two sharply defined streaks coming off the light at 60-degree angles and opposite at 240-degree angles — a brand-new phenomenon. I started puzzling over what this meant, but I chose to wait it out before I panicked. By the eighth night, the streaks were gone. A temporary wrinkle in my posterior capsule (the back part of the “bag” holding the eye’s lens) probably had caused the problem. At my one-week postoperative visit, my visual acuity without correction was 20/15. My intraocular pressure was 19 mmHg. 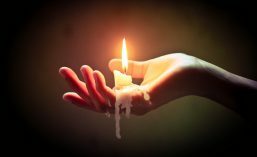 I had only a trace of internal inflammation. But on this visit, her vision was 20/50 in one eye and 20/60 in the other eye, even though she said she still had no visual complaints. She became the first patient to whom I revealed that I recently had undergone cataract surgery. And this time, I took an entirely different approach when we had my standard cataract discussion that had been brought up at different times during the past decade. This entry was posted in COPD, Emphysema and tagged Cateracts, COPD. Bookmark the permalink.